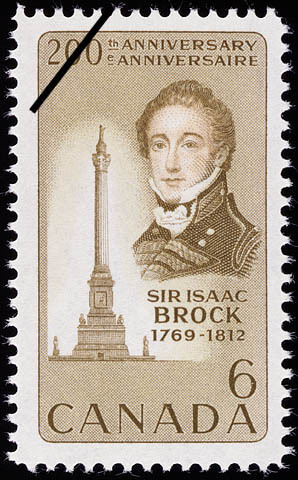 The value of a Sir Isaac Brock, 1769-1812, 200th Anniversary - 6 cents 1969 stamp depends on several factors such as quality and wear, supply and demand, rarity, finish and more. Values in the section are based on the market, trends, auctions and recognized books, publications and catalogs. This section also includes information on errors and varieties and characteristics. Major-General Sir Isaac Brock, K.B., a man who died on Queenston Heights leading his troops in the successful defence of Canada, was born on the Island of Guernsey on October 6, 1769; the anniversary of his death occurs on October 13. Brock, a tall man of imposing bearing, described by historians as unquestionably honest, is referred to as not only a gentleman but a gentle man. Although little is known of his father other than being a sailor, his mother, Elisabeth de Lisle, had been the daughter of the lieutenant-bailliff of Guernsey, a position comparable to that eventually assumed by Brock when, in 1811 he was appointed president and administrator of the Government of Upper Canada. He was a descendant of Sir Hugh Brock, a valiant knight in the reign of Edward III who had been in Brittany, then an English duchy; leaving Brittany, the family settled in the Channel Islands. A relationship existed between the Brock family and Lord de Saumarez, also a Guernsey man, who had distinguished himself at St. Vincent and at the Nile. The man eventually referred to as the Hero of Upper Canada entered military service at the age of 15; twelve years later he was gazetted lieutenant-colonel of his regiment and in 1811 elevated to the rank of major-general. It was with anything but elation that Brock received orders for the transfer of his regiment, the 49th, to Canada in 1802, the undeveloped land of some 300,000 people, his destination and destiny, was regarded as out of the main stream of world events. In the following 10 years he devoted great energy to familiarizing himself with Upper and Lower Canada, in the latter he put to good use in fluent command of French acquired during study under a French pastor-tutor at Rotterdam. So deeply rooted was his acceptance of responsibilities that in 1812 he chose to remain for the defence of Canada when offered a command elsewhere. Upon the outbreak of war with the United States of America in 1812 Brock had some 1450 British regulars under his command; organizing militia units to bolster his strength, he sought and won cooperation of the native people, particularly the Six Nations Indians on the Grand River. Meeting with Tecumseh there was an immediate reciprocation of respect consequently the famed Indian leader led his people in cooperating. Morale of the defenders soared when one Brock's first orders led to the fall of Detroit; later, the General's insight led him to believe an assuault would be made across the swirling, rushing Niagara River under the heights at Queenston. When the attack came, Brock fell mortally wounded, while leading his men to re-capture an 18 pouder. An enemy tribute to the recognized qualities of an adversary was evident when, during burial. American guns boomed in unison with Canadian guns saluting a dead General. Some twelve years after death Brock's remains were removed to a vault under a 135 foot monument on Queenston Heights; destroyed by an explosion in 1840, the memorial was replaced by the even more imposing 190 foot column.